This beautiful 3 bedroom 2 bathroom villa has a fantastic outlook over a lake with a south facing pool. It has modern furnishings and the floor is laid to tile giving it a cool feel in the hot sunny Florida days. It is situated on Lake Berkley Resort which has plenty of facilities to enable you to fully enjoy your vacation. A three bedroom / two bathroom ranch style villa on a fantastic community with all the facilities you could possibly need on your vacation. The property has been decorated to an exceptionally high standard and gives a clean and crisp feel as you walk through the front door. The tiled floor throughout gives the place a cool feel and instantly gives you the sense you are on vacation. The open planned living room looks out onto the private pool, which in turn looks out onto a lake giving a tranquil effect. There is also a dining area in the main part of the house with an opening to the kitchen with a further eating area giving the property a real socialable feel to it. The bedrooms consist of a king-sized master with ensuite that leads out to the pool deck, a queen and twin. The house has everything to keep you entertained, a TV, DVD, games console with games in the living room, a TV with DVD and video in the master and a TV with video in the queen. The whole house is also served by a wireless internet connection allowing you to plan your next day on the web. All bed linen and towels are supplied, including towels for the pool. THIS HOME HAS JUST HAD BOTH BATHROOMS RE-MODELLED WITH BEAUTIFUL MARBLE COUNTER TOPS, THE POOL HAS RECENTLY BEEN RE-SURFACED, A NEW 50" PLASMA TV HAS BEEN INSTALLED AND THERE ARE OVER 100 DVDs FOR YOUR ENJOYMENT PLUS BIKES FOR YOU TO CYCLE AROUND THE RESORT ON. The Lake Berkley Resort is built around a large woodland-fringed spring-fed lake, which has a sandy beach, a dock, a boardwalk nature trail, and volley ball, with the added enhancements of a clubhouse with a fitness centre, floodlit tennis courts, a community pool and heated spa, and a children’s playground. All resort facilities are freely available to all villa guests. 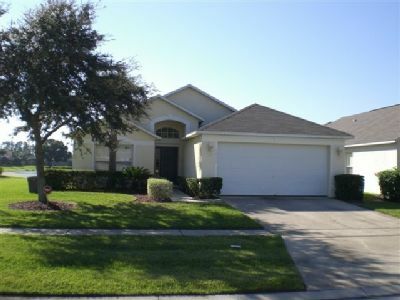 For added security there is a manned front gate to the community which is ideally located just minutes from the Walt Disney World entrance, Lake Berkley Resort is situated just south of US 192, off Oren Brown Road which makes it’s relation to direct routes to the major attractions most ideal. The Poinciana Boulevard will take you to the Osceola Parkway toll road for a direct and peaceful route straight into Disney. The same route leads to the US 535 if you are heading towards Universal Studios or downtown Orlando. 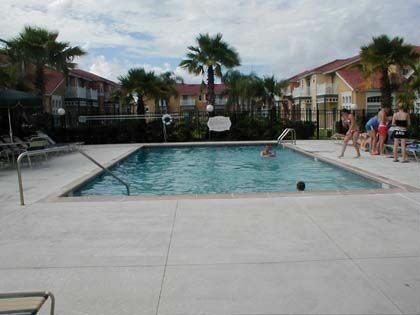 This great community is located in West Kissimmee, just a mile from the bustling 192 for eating and shopping and within walking distance of a Wal-Mart Superstore. Me encanto excelentes villas la recomiendo 100% .Para el año que viene vuelvo.GRACIAS!!!! Als wir das Haus betraten, waren wir zuerst etwas enttäuscht, weil es viel kleiner ist als viele andere Häuser, die wir in Florida kennen lernen konnten. Aber es hat ja auch "nur" 3 Bedrooms und 2 Bathrooms. Je länger wir dort waren, umso mehr erkannten wir den Charme dieses Hauses. Die Lage ist hervorragend, das Haus ist sehr sauber, das Badezimmer vom Master-Bedroom ist ganz neu. Die Terrasse direkt am See mit Alligator lädt zum Entspannen ein. Die Teppiche sollten bei nächster Gelegenheit erneuert werden, dann ist dieses Haus für 2-4 Personen perfekt!